My partner may be from North India, but with his love of cowboy hats and biscuits, sometimes you’d swear he was from the Deep South. A typical weekend breakfast at our house consists – at his request! – of spicy sausage biscuits with slices of fresh tomato; buttery grits with hot peppers; and always – always – tater tots, hash browns, or baby cakes. With a cup of chai, of course! The entire breakfast is vegan and surprisingly easy and fast to throw together. Tater Tots – Most brands are vegan and there are even quite a few organic varieties. I throw these in the oven first, since they take about twice as long to bake as the biscuits. Serve with organic ketchup. 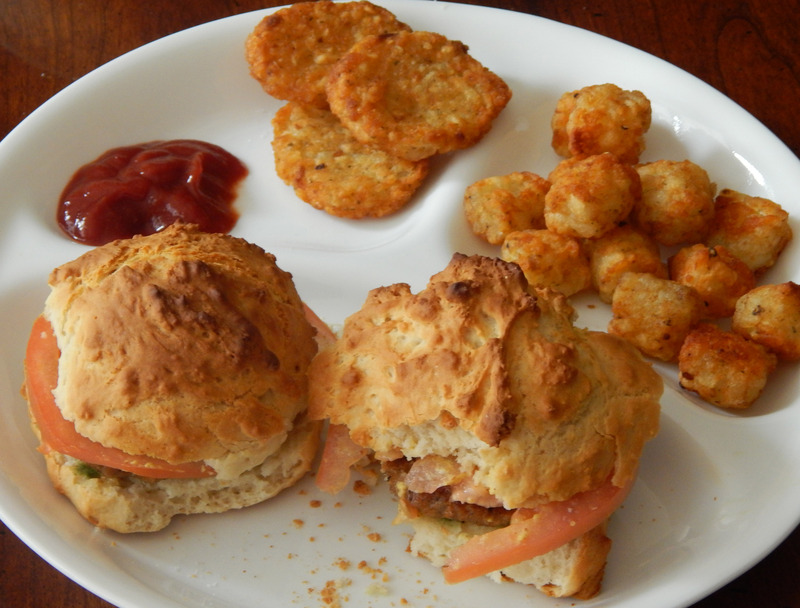 Biscuits – Sometimes I make biscuits from scratch, even rolling out the dough, but weekend mornings I usually rely on “spoon” biscuits using Bisquick Heart Healthy Mix. Simply pour the mix into a bowl, add the appropriate amount of soy or almond milk, stir, and then drop by spoonfuls onto a cookie sheet and bake. How simple is that? Sausage – I use Gimme Lean, a vegan sausage that comes in a tube. I slice off enough for several patties, then add a little salt, freshly ground black pepper, and a generous pinch of cayenne pepper, then mix it together with my hands and form into patties. The patties are then lightly fried in a little oil (necessary to get that browned, sausage-y effect). These go in the biscuits as well as slices of fresh tomato, a little Vegenaise, and sometimes a little Indian chutney. Sometimes, instead of sausage, we vary this by using Yves Canadian Bacon slices or breaded Gardein Chick’n Tenders – in which case we usually use Dijon mustard. Grits – We’ve tried making “cheezy” grits, but nutritional yeast in grits does not taste like cheese to us – it just takes like nutritional yeast. And we hate Daiya! So, after quite a bit of experimentation with “cheezes”, I’ve reverted back to classic Southern grits – buttery, salty, with hot peppers. Simply make according to directions, adding some fresh hot peppers while they cook. Sliced jalapenos are traditional but often I add a finely diced Thai green chili pepper or two, since that’s what we usually have on hand. Stir constantly while the grits cook to avoid lumps. Then, when the grits are done, add a generous dollop of Earth Balance and lots of salt and freshly ground pepper. If you’re interested in chai, the recipe is here. Well, I guess I know who’s house I’ll be at next weekend 😉 Thanks for the ideas, sounds wonderful. LOL, I’ll make some extra biscuits for you! This looks so delicious! I’m thinking breakfast for dinner! Thanks! It’s definitely fast and easy! It’s a baking mix that’s been around forever … I know my mother used it in the 70s and 80s for casseroles and “impossible pies”. 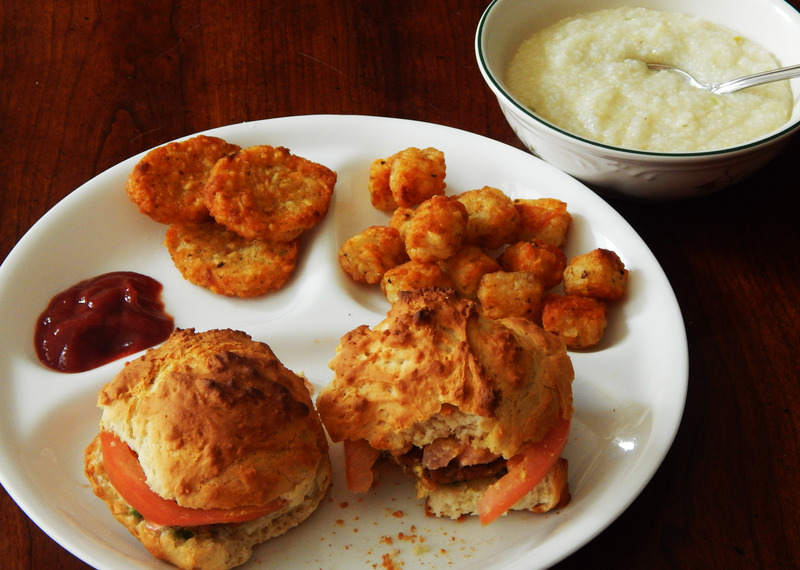 It could be kind of a “Southern thing.” The biscuits aren’t quite as good as homemade, but they’re considerably better than the refrigerated or frozen kind – plus much more economical. Ooh your method with the Gimme Lean sounds extra tasty. I haven’t had a breakfast sandwich like that in ages. One of the great things about Gimme Lean is you can alter it to suit your taste. Adding some sage or crushed red pepper flakes is good, too. Looks like a breakfast my fiance would actually eat! Thanks for the inspiration! You’re welcome! I think I’ll start posting more posts like this … we do a lot of cooking from scratch and “recipes”, but we also tend to “throw things together” a lot and make creative use of convenience foods. There’s so much you can have for vegan breakfast beyond scrambled tofu.